Who Is Winston Duke? His Wife, Girlfriend, Height, Is He Gay? Home Actors & Actresses Who Is Winston Duke? His Wife, Girlfriend, Height, Is He Gay? Everyone likes the role of M’Baku in the superhero film Black Panther. Sure, he saved the moment when everybody thought king T’Challa was far gone and Erik Killmonger (played by Michael B Jordan) had succeeded in taking over the Wakanda kingdom. But as we all focus on this victory, we shouldn’t forget the man that brought life to that role; Winston Duke. You may call him a young Hollywood star or starter, Winston only started his career in 2014 and within his short presence in the industry, he has proven that he is just starting with the world. He has given his best and hopes to keep impressing the audience. Let’s take a look at his promising career and how much of an impact he has made so far in the industry. Winston Duke was born on November 15, 1986. He spent the early years of his life in Argyle, Tobago where he was born. At age nine, he and his family moved to Rochester, New York. His nationality is American but he is a native of Tobago and his birth sign is Scorpio. He first sharpened his acting skills in Yale School of Drama where he later graduated from with his Masters. There, he met his fellow Blank Panther co-star, Lupita Nyongo. While in Yale, he and Lupita always fantasized about working for Marvel. Little did they know that their imaginations will someday become a reality. Before going to Yale, he attended Brighton High School in New York in 2004 and obtained a degree from the University of Buffalo. Winston Duke is from a family of go-getters and that explains his personality as a determined achiever. His mother juggled between running a restaurant and government job. She later disposed of every single thing they had to make a crucial relocation to Brooklyn so his sister could pursue her dream of becoming a medical doctor. Then, little Winston was nine and still unsure about what he wanted to do. By the time Winston hit his teens, he was sure that his calling was to act. He started acting immediately after high school, thanks to a Spanish teacher who recognized his talent quite early and suggested he consider acting. She got him signed for drama club to hone his skills. When he was done from the different higher institutions he attended, Winston Duke started taking small roles in some productions for Yale Repertory Theatre and Portland Stage Company. He made his TV debut in TV series Person of Interest. This role was followed by appearances in TV shows such as The Messengers and Modern Family. He also appeared in the TV series Law & Order: Special Victims Unit and Major Crimes. In 2016, Winston moved to Los Angeles in search of bigger opportunities. Lady luck shone on him that year when he scored a role in what seems to be one of the most celebrated films of the recent time, Black Panther. His portrayal in the Marvel production as M’Baku, the king of the Jabari tribe who had little or no compassion for others was his first big screen role. Thus, what was more special about the role wasn’t just the fact that his biggest dream was coming true but because he was making his first big screen appearance in grand style. For that singular reason, Winston gave all his best to ensure he stands out in the film. He didn’t just read the script, the actor tried to make his character standout and as such, he introduced many funny habits of making signature grunts sound when he wanted to kill someone. Also, in a bid to make his tribe very different from the rest of the Wakandas in the film, he conducted in-depth research. In an interview, Winston revealed that he basically focused on Nigerian and Igbo influences, especially the way of calling and responding in the tribe to achieve something that is unique and yet clear for his tribe in the film. The result surely made his character very memorable. Good a thing he nailed the role so powerfully and the film brought in a worldwide haul of about $1.3 billion. Since his role in Black Panther, the actor’s doors have opened even wider with a role in another box office smash hit Avengers: Infinity War. He is also expected to reprise this role in Avengers 4 coming in 2019. While we wait expectedly on the Avengers 4, Winston is ready to make more profitable moves. He hopes to work in many upcoming big projects in the industry such as the reboot of Bad Boys, a new version of the infamous film franchise that originally starred Will Smith and Martin Lawrence. As a young Hollywood face, Winston’s personal life is not well-known. Maybe with time, more will be unveiled about him. For now, speculations are all the proof available and one of such claims that the actor, despite featuring in a film that broke history for promoting black excellence is dating a White/Asian woman named Meesh. Not much is known about this beautiful lady as the Black Panther star seems to be shying away from controversies. But fans across the world have done some digging and are blasting him for his disloyalty to his origin. Some even suggested that the black community should boycott the film as it was a form of treachery. However, it appears many understand that a star’s character in a film shouldn’t affect the person’s private life and are not heeding to the advice. 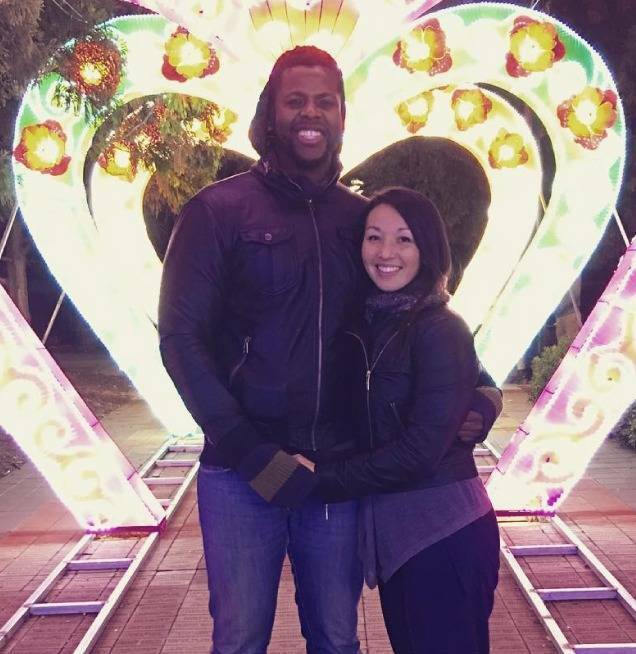 Winston Duke is definitely not gay since he has been linked with a woman. So, if you have been taking him as gay, it is time to give it up. He is straight though not up for grabs since he is currently in a happy relationship. His character in Black Panther portrayed him as a giant or some kind of exotic human being, but the reality is, Winston is quite tall. In fact, he is one of the tallest in Hollywood, standing at a height of 6 feet 4 inches which is about (1.94 m). The actor had, however, revealed on his Twitter account that he is 6 feet 5 inches but listed the former so he gets roles in films but since this hasn’t been verified, we are going by the official height. Also on the plus side, Winston has a good physique with well-chiselled abs and chest. This is so because he continues to train consistently at the gym after having trained slightly more than usual for his role in Black Panther. Many female fans have also made him their celebrity crush for his dark-skin magic.